This delicious recipe for banana cupcakes allows you to make a few batches of tasty cupcakes in minutes. Our creative team has come up with the genius idea of turning a healthy snack into a delicious treat that’s fun for all the family to make. These easy to make cupcakes allow you to have one of your 5-a-day in a more delicious way. As well as being high in fibre and potassium this creamy, rich and sweet fruit is a favourite food for everyone from infants to elders. They are delicious to eat on their own or why not top them with butter icing, or dip them into custard….yum! 1. 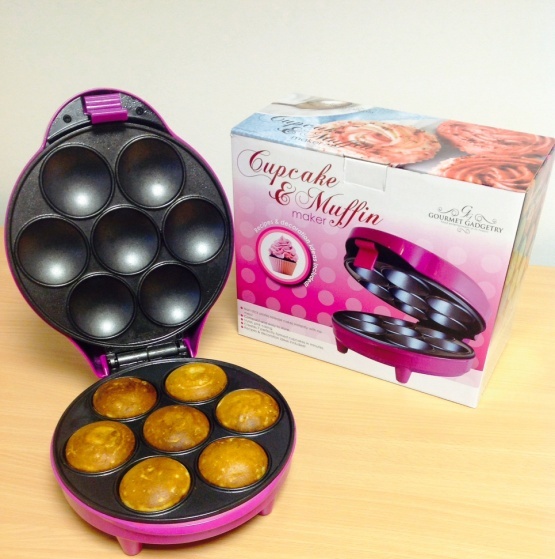 Open the Gourmet Gadgetry Cupcake & Muffin Maker, and spray the heating plates with cooking oil lightly. 2. Turn the Cupcake & Muffin Maker on and leave to pre-heat. 3. Sift all the dry ingredients into a bowl and mix together. 4. Put the butter and sugar in a separate bowl and beat together until it’s creamy, then add the eggs and beat. 5. Mix both the wet and dry ingredients together. 6. Add a bit of milk at a time whilst mixing then add the mashed banana and mix through. 7. Then carefully spoon the mixture evenly into the cavities. Be careful not to overfill as they will expand once heated. 8. Close lid of the machine and allow to bake for approximately 4-5 minutes. If needs be allow to bake for a further 1-2 minutes. 9. Finish off with butter cream or chocolate icing and slice of banana on top of each cupcake.